Memorial Day. I really struggled with writing something to post in honor of the day and in honor of gardening. Every newscaster is quick to point out that today marks the unofficial start of summer, which in my world means that all of May has gone by and I have yet to get everything in the ground. As I worked outside this holiday weekend, digging, planting, weeding, pruning, and barbecueing, my first instinct was to take a couple of photos around the yard and post them — you know, a red, white, and blue motif. Red, white, and aaaahhhhhh blue. Then I had a second thought. It seemed disrespectful toward the true spirit of the holiday. So I went online to look for something that I could comment about, something about veterans and gardening. There was plenty of information on Victory Gardens from World War 2, as well as healing and therapeutic gardens for returning soldiers and older veterans. One website, though, captivated me. Defiant Gardens is a compelling website designed to coincide with Defiant Gardens: Making Gardens In Wartime, by Kenneth Helphand. 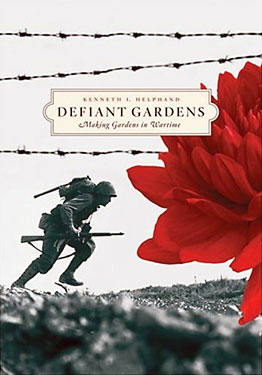 Through photos and narratives, the site defines defiant gardens as “gardens that are created in extreme or difficult environmental, social, political, economic, or cultural conditions.” But defiant gardens could not exist without the passion and dedication of defiant gardeners, among them soldiers stationed in Vietnam, Afghanistan, Iraq, and so many other sites of conflict. Very often, the soldiers received seeds from home, and then went to great lengths to create a patch of home in their hostile location. Each story is inspirational, and all are a reminders about who we are, not only as gardeners, but also as Americans. For many of the defiant gardeners, their gardens represented peace, tranquility, and creation in lands full of chaos, violence, and destruction. And this had me thinking about the nature of all gardeners in general. Perhaps defiance is an essential trait for gardeners. Just think about it for a moment. Our gardens represent our attempt at imposing some sort of order on a wild environment. We are determined to turn hardscrabble land into a fertile oasis. And at the end of the day, there is a sense of satisfaction of a job well done, and our garden is our own. For many of us, each day is a battle. Just look at the stress we face: work, traffic, children, bills, etc. A garden, no matter how large or small, rewards us with peace and comfort from the outside world. Even a tomato plant growing in a pot on a terrace represents a small piece of triumph over the rigors of daily life. I say it all the time. I love my backyard, and the older I get, the more difficult I find it to want to leave my yard. I wonder if there are other gardeners out there who feel the same way, and maybe the more stressful life becomes, the greater is our need to stay in our yards. Above three photos courtesy of Defiant Gardens. I am in no way suggesting that our defiant gardens could match the defiant gardens found in wartorn countries. Similarly, my stresses are nowhere near the stresses of a soldier now stationed in Afghanistan. 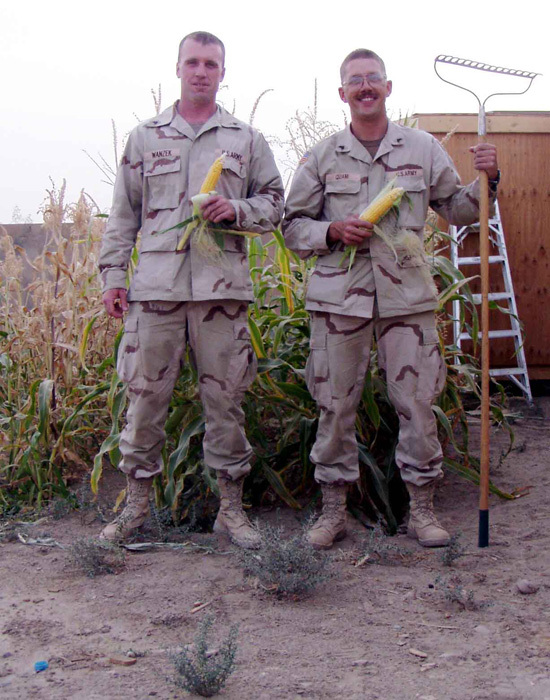 As a matter of fact, if not for the sacrifices of these men and women today and yesterday and tomorrow, our home gardens would not be able to exist. Like I said, the Defiant Gardens website was so moving that it put my initial red, white, and blue photo idea to shame. I hope all of you will find time to explore the Defiant Gardens site, and this Memorial Day, remember those who have — or still are — protecting and defending us and our gardens. Hi Kevin. What a wonderful article. 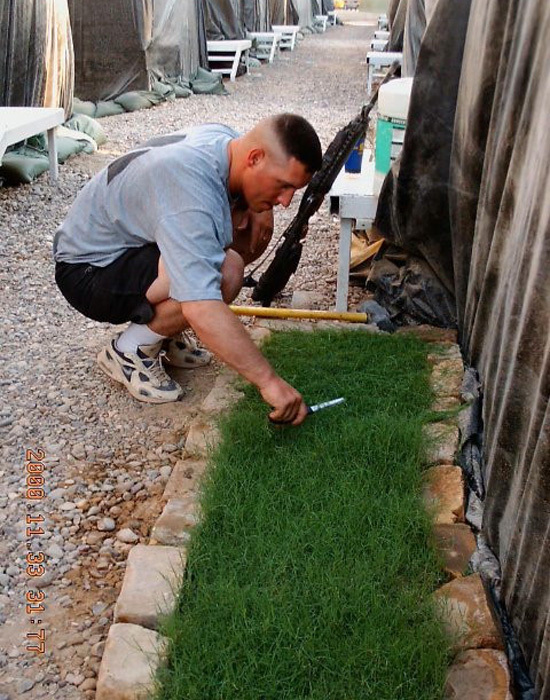 I had always gotten peace from my gardening but I never realized how it could benefit or what it may mean to those soldiers far from home. Thank you for sharing this with us. Thank you for your comment. Glad I could shed some light on whole other side of gardening. Very appropiate and spoken well. Thanks. The website really had me thinking. A perfect tribute to our veterans from a gardener’s pen. An excellent post! Now, I want to go click on that link and check out the other one. Thanks for commenting! The site is really amazing and quite touching. Happy Memorial Day. I didn’t know about Defiant Gardens. I will definitely check the site out. This was a lovely tribute to our military and the true observance of Memorial Day. Thanks for reminding us all of the sacrifices that are made so we can continue to enjoy our freedom! God bless America! Hi. It’s well worth a visit. Very moving.